The dominant story of the January transfer window by some stretch has been the move of Spanish playmaker Juan Mata from Chelsea to Manchester United. Now that Mata has finally become a United player, I decided to take a look at the significance of his signing, is he the player United need? How could he fit into the starting line-up? Mata joins United for a club record fee of £37 million, a figure which is significantly more than the £30.75 million which United paid for Dimitar Berbatov back in 2008. The difference this time is United are in desperate need of world class footballers and more specifically, midfielders. 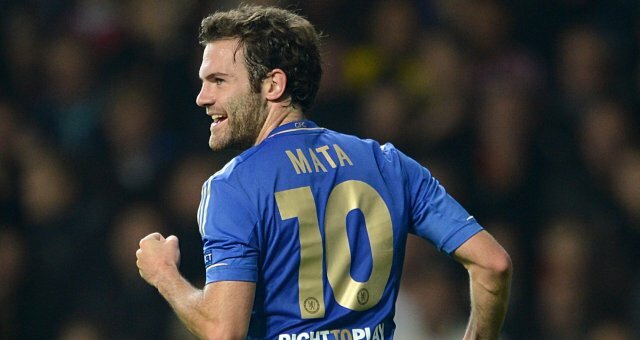 Mata was the player who shone the brightest for Chelsea last season as the Blues finished third in the Premier League behind Manchester City and eventual champions, Manchester United. He was the man at the heart of Chelsea’s attacking football. Playing in the centre of an attacking midfield three, he was given the freedom to pull the strings for his side, laying on chances for Eden Hazard, Oscar and Fernando Torres with his array of clever, intricate passing. Mata excelled in the playmaker role and to cap a fantastic, individual season he was named Chelsea’s player of the year. His performances speak for themselves, but here is a brief breakdown of the Spaniards statistical importance to Chelsea last season. Mata made a total of 35 Premier League appearances and made 12 assists for his team mates, the most of any Premier League player last season. Overall, Mata created a monumental number of chances as he laid on 95 goal-scoring opportunities in total. This was 48 more than Oscar (47) and 30 more than Eden Hazard (65) who was his closest rival. The Spaniard’s importance to Chelsea was not just limited to his creativity as he came into his own in front of goal by finishing with 12 league goals for the season. Mata ended the season as Chelsea’s second leading goal-scorer with 20 goals in all competitions and only two behind fellow countryman Fernando Torres. (All stats taken from Squawka.com). After such an impressive campaign, Mata has since found himself out in the cold this season. Under Jose Mourinho, he has been limited to mostly substitute appearances with several players higher up the attacking midfield pecking order. Mourinho prefers a high work ethic amongst his players and therefore, favours those midfielders who fit his philosophy of high-intensity pressing of the opposition. It has been clear throughout this season that Mata doesn’t fulfil these criteria. Mata’s creativity and eye for a goal will bring a new lease of life to United’s attacking play and he could form a formidable forward axis with Wayne Rooney and Robin van Persie when they reach full fitness. Whilst Mata’s ability has never been in question, I still find myself asking whether he is the player that United need right now? David Moyes has historically built his teams on a strong defensive unit and that is something that United have significantly lacked this season, especially in central midfield where there has been an absence of physical presence and box-to-box energy which someone like Yaya Toure provides at Manchester City. Mata definitely doesn’t embody any of those characteristics and I’d have thought that a player with energy and steel, a powerful midfielder like Paul Pogba or Arturo Vidal would have been a higher priority for Moyes. Another question that is up for debate is how will Mata fit into the United starting line-up? Here are a few possible line-ups/formations that I came up with. Here I’ve gone for a 4-2-3-1, a formation which seems to be the gold standard these days. The main problem I see with this formation is that Rooney is out of position on the right-hand-side of midfield. This could throw up all sorts of issues with the player himself and Rooney’s history of spats over his position are well documented. Having said that, this leaves Mata in his favoured position behind the centre forward. Secondly, I went for a 4-3-2-1 Christmas tree formation. This allows both Rooney and Mata to be deployed in central attacking midfield roles with Van Persie up front. However, there is a distinct lack of width with this set-up without Valencia or Januzaj and there would be plenty of space for the opposition fullbacks to attack down the flanks. Finally, I went for what I think is the best formation to accommodate Mata, a 4-4-2 diamond. This allows Rooney to play in his favoured position up front but also keeps Valencia and Januzaj in the side to provide width when needed. In this formation, Mata can also sit in his favoured position behind the strikers, dictating United’s attacking play and create the chances for Rooney and Van Persie. Realistically, if both of the aforementioned are fit to play, then they are guaranteed starters and the same can be said of Mata. The main problem is how do you fit all three into an effective team? No matter which formation Moyes decides to employ, the Mata’s arrival has effectively thrown up more questions than answers and it will be up to the manager to come up with the winning formula. As I eluded to earlier, there have been questions raised as to whether Mata is the right man for United at this moment? Here’s my ambiguous answer to that; is there ever a wrong time to sign a player of Mata’s quality? There’s no doubt that Mata will bring an extra touch of class in the final third which United have been missing. I’ll be glad to see him return to the pitch on a regular basis and the prospect of Mata playing alongside Rooney and Van Persie when the pair return to full fitness is nothing short of mouthwatering. However, Moyes is fighting several fires across his squad and it feels as though the Mata signing is a small part of a larger rebuilding project underway at United. A number of signings are required before Moyes’ team can return to the level of performance that Premier League fans have become accustomed to over the years. I’ve no doubt it will be a busy summer for United but in the meantime, Mata could provide that extra attacking impetus to see his new team through to the end of the season and help secure that all important top four finish.